Management practices targeting pathogens focus on establishing multiple barriers between the pathogen source and water, with each barrier designed to lessen the risk of pathogens. Identifying and quarantine of infected animals. The farm’s veterinarian is an important partner in implementing the first two barriers. 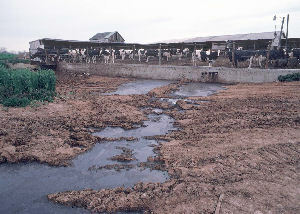 Preventing transport of infected manure onto the farm on clothing, boots, or equipment; Controlling pets, rodents, and other animals that can introduce pathogens to the farm. Ensuring that all feeds and feeding utensils are clean. Barriers 1 and 2 will vary with species from this dairy targeted approach. A species specific bio-security program encouraged by industry or veterinarian organizations is the foundation for the first two barriers. Uncontrolled runoff from open lot housing is a high risk source of pathogens. Image courtesy USDA NRCS photo gallery. Elimination of runoff from animal housing and manure storage (e.g. runoff collection ponds, vegetative filters). Extended storage of manure. 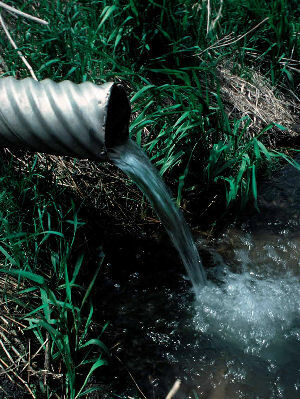 Liquid systems receiving manure daily typically produce a 10-fold reduction in pathogens. Two storage facilities (no fresh manure additions for two months prior to land application) further reduce risk. Composting. Well managed composting systems can eliminate most pathogens. Anaerobic digestion. Digesters operating at 100 degrees F can produce a 100-fold or greater reduction in pathogens. Avoiding application on tile-drained areas during periods of tile flow is an example of a Barrier 4 practice. Source: Jane Frankenberger, Purdue University. Immediate incorporation of manure into soil. This practice must be balanced with residue loss and increased erosion potential. Implementing sound soil conservation and runoff management practices in crop land (e.g. reduced tillage systems, grassed filters). Applying manure from higher risk animals (e.g. calves) to crop land with lowest risks of runoff, erosion, or groundwater infiltration. Applying manure to tiled fields only when the soil is relatively dry. Tile drained fields present a unique risk due to macropores caused by roots, earthworms, or cracks. Managing drainage water by raising drain outlets before manure application also reduces pathogen risk. Pathogen transport and risk reduction is addressed in the multiple webcast Microbes: From Farm to Public Risk.